Our large fleet of tractors and fully owned trailers are the core of our assets and are readily available for just about any LTL shipping or truckload shipping request, regardless of size. We take great pride in accommodating the needs of our customers and providing great value for our services. Contact us to Inquire about our services or choose from the selection below. Whether you have enough freight to fill a trailer, or prefer a dedicated truck, full truckload shipping could be the choice for you. Truckload rates are not based on the classification of the shipment. Instead, the pricing depends on lanes and mileage. As a result, full truckloads can be an attractive option. This service is best used for shipping refrigerated, frozen or temperature sensitive freight. Set your own temperature and we will keep it cool. If you need lanes covered on a daily or weekly basis, a dedicated carrier is a must. With available capacity and 99% on-time performance, MDS ranks among the most reliable carriers in the nation. Our brokerage service can help fill any gaps through its 3PL carrier network. Flatbed load shipping is normally used for moving large manufacturing and construction items. An open bed or trailer with a wide, flat surface and no sides is used for moving large objects or heavy machinery that are otherwise hard to load or unload using conventional closed trailers. Flatbed shipping provides access to cargo from all angles and offers dimensional flexibility for various types of loads. 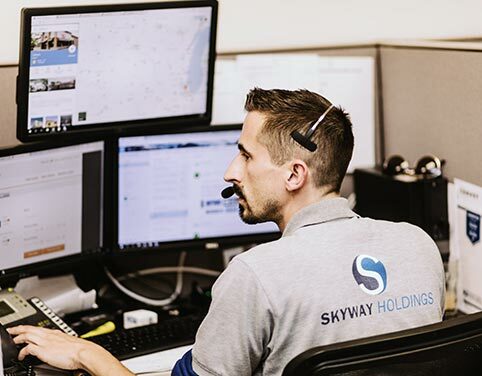 Skyway Holdings began with one simple, yet challenging, proposition: to become a world-class, diversified transportation logistics company. As we grew and became a fully integrated service provider, we gained many new customers and business opportunities. Nevertheless, we remain true to our success formula — providing quality service on a personal level. Our mission is to change the way you move freight. Choose any of the services we provide, contact our friendly and professional staff, and leave the rest to us. If the volume of your shipment does not require a full truckload, or if you are shipping product samples to commercial or residential addresses, LTL could be the choice for you. LTL rates are determined by class, weight, and destination zip codes and are generally lower than full truckload rates. If you need lanes covered on a daily or weekly basis, a dedicated carrier is a must. With available capacity and 99% on-time performance, Our partner MDS ranks among the most reliable carriers in the nation. Our brokerage service can help fill any gaps through its 3PL carrier network. Is time of the essence? Expedited shipping is the perfect solution for you. With expedited shipping you get non-stop, door to door service. Less stops provide the advantages of speed, less handling, real-time updates, and added security. An experienced freight brokerage company is needed to coordinate all elements in a successful and time-saving manner.